First Aid Kit There are 10 products. This First Aid Kit is small and convenient - it can be put in your pocket. You can be confident that in the event of small injuries, the Promo will have the necessary supplies. This First Aid Kit has been developed in cooperation with several European humanitarian organisations and contains all the initial products you could need in the event of a minor injury. All packaged in a smooth coated fabric bag with zip opener and belt clip. 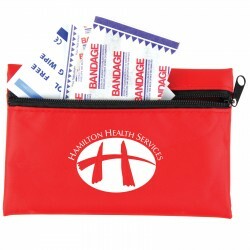 16 piece first aid kit, conveniently packed in a red zippered case. The ideal First Aid Kit for small injuries. It contains the most frequently used plaster and dressing materials for travel, business, home and do-it-yourself activities. Packed in a smooth, coated fabric bag with belt clip. A compact kit with reflective strips for use in and around your vehicle, home or office. This kit contains the most frequently used plaster and dressing materials. Perfect for storing in the glove compartment. Heavy duty bag, with external pocket and reflective strip,inside has 4 separate compartments so you can easily see all the contents at a glance. This kit is especially useful for travel, office or home .